Many people from all over the globe email me about what to expect on a “wilderness trail” in the context of Kruger National Park (note that in this context I am not referring to a wilderness hike in a wilderness area such as Cederberg). So here’s a collection of responses to these questions. I am no expert, but have been on most of Kruger’s seven trails, some of them more than once. In my opinion, a “wilderness trail” is the best way to experience the African bush – bar none. What is a “wilderness trail? 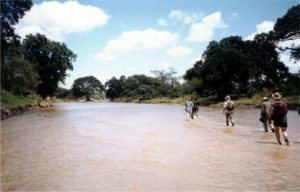 The “wilderness trail” is a concept unique to Africa in that it has evolved to imply a walk in the company of a game ranger or conservation officer, usually armed, through big game country. Aspects of the ecology of the area, environmental management and ethics are also explained and the emphasis is often on environmental education. Kruger National Park has seven such trails, comprising seven trails camps each located in large wilderness areas (60000 ha plus), remote from cars, roads, camps and people. Each camp accommodates 8 guests who spend 3 nights at the camps. The camps are staffed by the trails ranger, the assistant (or “second rifle”) and a camp cook. A trail involves two days of walking. 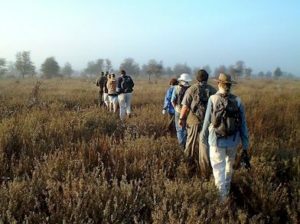 Kruger’s trails are: Sweni, Olifants, Wolhuter, Bushmans, Nyalaland, Napi and Metsi-Metsi. Wilderness Trails in this form originated at Imfolozi Game Reserve, I believe. All wilderness trails are potentially dangerous because you are on foot with wild animals. However, animals are usually more scared of humans and are only dangerous when cornered or surprised, or when protecting young. The trails rangers are extremely safety-conscious and will ensure that you are not put into dangerous situations. They are very cautious and always err on the side of safety. It is important to obey the rangers unquestioningly. I would say that the trails are exciting, rather than dangerous. Is the walking difficult or strenuous? The walks are not difficult. They are largely over flat ground and follow game paths. They are undertaken in the early morning and late afternoon, when it is cooler. The only discomfort will be the heat, depending on the time of year. The rangers will pace the walks to suit the group, and if you find it hard, discuss it with the rangers. On a walk you could walk anything up to 10km, but it depends on conditions and the group. The emphasis is not on “hiking” as such, but rather on experiencing, feeling, hearing, and smelling the bush, while learning about the ecology. Will I see the “Big 5”? No!! Unless you’re very lucky. If you participate in a trail with the aim of seeing the Big 5 up close you are guaranteed to be disappointed. Get the Big 5, especially the cats, out of your system by going on game drives or lodge safaris before you tackle a trail. Then you can relax and enjoy the experience: feeling, hearing, and smelling the bush, while learning about the ecosystem; facing up to your own insignificance; being in the food chain. I promise that it can be one of the great experiences of a lifetime if you allow it to be. a soft bag – there isn’t much packing space in the huts. The camps have a communal fridge, so take beers, wine and drinks for the evenings. How difficult is it to get a booking? Very. The trails run at high occupancy and are a well-kept secret amongst those in the know. You may have to book up to a year in advance. In summer, the days are very hot, and the nights will be warm too. Expect afternoon thundershowers. Of course, this is mosquito season too, so while there is the temptation to wear as little as possible in the evenings, you should rather cover up. Winters are dry and the days are pleasantly warm, while the nights will be nippy. If you’re not used to Africa’s heat, June to September is the time to visit. Game viewing is also better in winter because there’s less foliage, shorter grass and the game tend to converge on waterholes and rivers. What are the trails camps like? The camps are rustic and basic and the fence is not animal-proof (rather to keep the people in than the animals out, as the trails ranger will tell you), but you will seldom find animals visiting an area that smells of humans. luggage at home or elsewhere. The huts do have doors, as well as mesh-covered windows and mosquito nets hang above the beds. The huts are also raised off the ground, so you should not have problems with mice or insects or snakes. Bedding is provided, and you won’t even be required to make your bed (the camp cook will take care of that)! The toilets (flush toilets) and showers (gas-heated) are separate from the huts and are communal, and there is no electricity, but lots of paraffin lanterns. Camp life revolves around the lapa – where a boiling kettle, tea and coffee are always available – and the fire-pit. Meals are served at the lapa twice-a-day: a brunch after return from the morning walk, and dinner under the stars. The cooking is basic, but filling and tasty – good, simple bush cuisine. What is a typical day’s routine? you’ll be woken up by the camp cook before sunrise. listen to the nocturnal sounds and sleep.